First Impressions of Bruce Springsteen’s “Wrecking Ball” – Track #5 – “Death to My Hometown” - Stream this "Irish-laced rock hymn" for free at Paste Magazine! To hype the March 6th release of his new album, Wrecking Ball, Bruce Springsteen is releasing each of the record’s eleven tracks online, one per day, streaming for free at various music websites. I’ll be giving you my first impressions – not reviews, mind you, as I’m not comfortable reviewing anything without hearing the full album – of each track as they are streamed. Today, we’re looking at Track #5, “Death To My Hometown,” which is streaming online for free all day at Paste Magazine. You’ll definitely want to give this one a listen. Read my thoughts on “Death to My Hometown” after the jump…. Starting with “Easy Money,” one of Springsteen’s key interests on Wrecking Ball has been the unjust nature of the financial crisis. The greedy crimes committed on Wall Street that led to the collapse have put millions of Americans out of work and hurt nearly everyone else, but these people have gone legally unpunished while the innocent men and women of the lower classes pay the price. The singer of “Easy Money” figured that if the rich can rob without repercussion, then he can too, while “Shackled and Drawn” expressed the burden the wealthy have placed on the lower classes. Though the term “class warfare” doesn’t appear once in the song, Springsteen seems determined to demystify the concept. He begins by reserving the battle-imagery for actual combat. I’ve always found it incredibly disrespectful to our troops to define anything other than real battle as “war,” and Springsteen seems to agree. The struggle he’s describing isn’t a literal war; rather, the way his town was ravaged by greed and left to fend for itself feels like the end result of a war, a pain much more real and significant than whatever harm is caused by letting citizens protest the actions of Wall Street. The second verse mirrors the first, using more war imagery to describe the crushing blow of economic hardship on the singer’s hometown. Springsteen specifically references the destroying of factories and seizing of homes, two problems many Americans will recognize and hold a special relevancy for Springsteen. His own hometown of Freehold, New Jersey went through much of this while he grew up; it’s what the song “My Hometown” is about, and “Death” expresses a new level of anger at seeing how much farther Freehold has fallen in the time since Springsteen left. The songs on Wrecking Ball are all so immediate and topical that it’s easy to think Springsteen is responding to the latest recession, but I don’t think that’s the case; many of these problems can be traced back to the Reagan years, which is when Springsteen started singing about these topics. The death that rained down on the singer’s hometown didn’t happen in the last two years; it’s been a long, gradual process, one emphasized by the most recent economic downturn. Here, Springsteen expresses the importance of educating oneself on the past to prepare for the future. The “get yourself a song to sing” line is particularly crucial, and the idea will recur on later tracks; if you have something to say, and you know how to say it, and you can keep that message with you at all times, then it will be much harder for the “robber barons” to ever take you off guard again. The lyric also, of course, speaks of music’s power to unite and influence. It’s no coincidence that only after imparting this message, and giving his angriest indictment of letting white-collar criminals walk free, does Springsteen begin referring to the hometown as “our hometown.” Now that the story has been told, the fury processed and the song sung, it’s time for the entire community to come together as one; only then can they stand tall against the forces that threaten them. Like “Shackled and Drawn,” it’s easy to imagine this song being used in protests and marches, both for its lyrical power and its musical perfection. It’s just a damn fun song to listen to, a forceful, Irish-flavored take on the “Seeger Sessions” sound. I haven’t talked much about Ron Aniello’s production yet, but suffice to say, I’m greatly impressed. 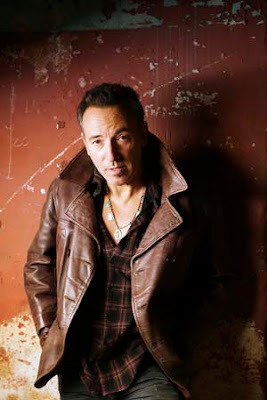 Under Brendan O’Brien – Springsteen’s producer from the 2000s – Bruce’s music often sounded constrained, too precise and limited to reach its full potential, but Aniello has given Springsteen free reign to go in whatever direction he pleases, while ensuring the end result always sounds great. No two songs have sounded alike so far, and having heard the full album (I won’t tell you how), I can assure you that trend won’t be broken. “Death to My Hometown” in particular is big and freewheeling in a way Springsteen hasn’t been since the “Seeger Sessions,” and I’m very glad Springsteen has found a new producer so in sync with his musical vision. I feel like I’m ending every review this way – and the rest of the reviews aren’t going to sound much different – but I can’t help it: “Death to My Hometown” is an incredible song, and Wrecking Ball is quickly revealing itself to be a modern Springsteen classic.